In Proceedings of the 2015 International Conference on Autonomous Agents and Multiagent Systems (AAMAS ’15), 2015, pp. 1521-1528. 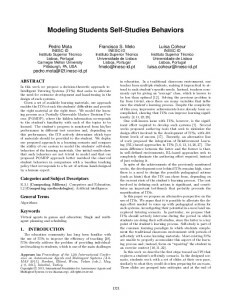 In this work we propose a decision-theoretic approach to Intelligent Tutoring Systems (ITSs) that seeks to alleviate the need for extensive development and hand-tuning in the design of such systems. Given a set of available learning materials, our approach enables the ITS to track the students’ difficulties and provide the right material at the right time. We model the learning process as a Partially Observable Markov Decision Process (POMDP), where the hidden information corresponds to the student’s familiarity with each of the topics to be learned. The student’s progress is monitored from his/her performance in different test exercises and, depending on this performance, the ITS actively determines which type of materials should be provided to the student. We deploy our proposed approach in a learning scenario and compare the ability of our system to model the students’ self-study behaviors of the learning materials. Our initial results show that such behaviors are not trivial to model and that our proposed POMDP approach better matched the observed student behaviors in comparison with a baseline teaching policy that corresponds to a fix set of actions hand-designed by a human expert. This project is funded by the Portuguese Fundação para a Ciência e a Tecnologia under the CMU | Portugal Program, and the Information and Communications Technologies Institute (ICTI).